Legal service the area of banking finance and institutional investment is in high demand in Bangladesh. Our Central bank in specific situations allowing international bank and international agencies to give loans to local entrepreneurs. Legal service is often required on regulatory banking for such international banks and agencies. Beside syndicated loan, project finance local and foreign bank needs strong legal support. On the other hand, entrepreneurs often require legal support for regulatory issues, for example, foreign exchange, credit inflammation, general banking and finance regulation related matters. Bank and financial institutions take legal support from lawyers for security documentation, for example, mortgage, hypothecation, etc. and registration of the same. Specialized financial institutions take expert legal support for venture capital financing, equity investment, Islamic finance, offshore banking etc. Complex transactions and investments for e.g. factoring are now slowly becoming popular due to the liberal approach taken by the central bank in recent years. Expert legal support is crucial for such transactions. For both borrower and lender recovery, related litigation is a common issue where they both require continuous legal support. Mr. Rahman has in-depth and specialized knowledge on banking laws and regulations pertinent to his two years working experience in central bank as a member of legal counsel for A Hossain & Associates with lawyers from leading law firm of France, Gide Loyrette Nouel and leading law firm of India, Fox Mondol in a world bank-financed project on Banking laws. 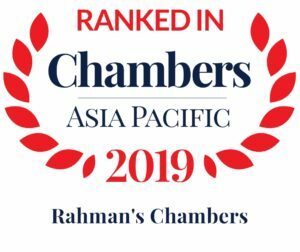 As one of the leading firm, in this area, Rahman’s Chambers provides all short of legal support ranging from international banking, complex trade finance, factoring, regulatory matters to security documentation and recovery cases etc. In particular with regard to Credit Information Report (CIB) of Bangladesh bank, as a counsel, Mr. Rahman successfully argued before Hon’ble court in a landmark case explaining the legal position of the guarantor. Mr. Rahman successfully argued the legal position as the guarantor, as per Bank Company Ain 1991 and Bangladesh Bank Order 1972 and was successful in its submission that name of the third party guarantor may appear in the CIB report however this will not stop them from taking loan from Bank. This is an important decision on the right to fair hearing principles. Mr. Rahman successfully argues on the exception to such right in suitable circumstances. The Chambers also handled several project finance e.g. Biman Bangladesh Airlines Limited for purchased of Aircraft. In recent times, the Firm advised a leading bank over factoring agreement on International trade-related receivable purchase signed with Prima dollar. We have collections of very old but valid circulars of central banks. We have advised on many aspects of banking e.g. regulatory, off-site and on-site supervision etc. We were involved in drafting major laws and circulars on banking. We have significant experience of working on equity finance, project finance and corporate finance. We have advised a number of venture investment companies. We have advised on cross border claims and on international lending. We have experience in dealing with offshore banking and FOREX issues. While working in the central Bank strengthening project for A Hossain & Associates in 2004 to 2006, Mr. Rahman was involved in drafting of several circulars, regulation and guidelines along with other renowned lawyers from Fox Mandal, India & Gide Loyrette Nouel, France on several matters including banking regulatory, money laundering, credit information, supervision, foreign exchange, Islamic banking etc. This in-depth knowledge and experience of Mr. Rahman clearly give an extra edge compared to other competitors in the market. The Chambers have deep knowledge as to banking laws as it was involved in translating the proposed Bank Company Act 2009, Bangladesh Bank Act 2009 and Financial Institution Act 2009 from English to Bengali for Bangladesh Bank. We have acted as legal counsel for proposed issuance of Bond for Grameen Danone Foods Limited and First Security Islami Bank Ltd and drafted finance documents against issuance of Preference shares for few of our clients. Similarly, we were also involved in the process of financing in bond issued by Banglalink i.e. Orascom Telecom Bangladesh Limited. One of the major achievement of the Chambers in 2011 is the reported landmark judgment of Writ Petition no. 6016 of 2008, Anwar Cement and Others vs. Bangladesh Bank and Others 2011, reported in 65 DLR (2013) 97; 40 CLC (HCD), in which Mr. Rahman have successfully represented Bangladesh Bank and Dutch Bangla Bank Limited in the High Court Division and assisted in bringing major amendment in the Credit Information reporting system for guarantor. In recent years, we have advised several high net worth individuals and companies over their banking issues in particular law and regulation involving CIB. (S.M. Akbar and Another vs Bangladesh reported in 70 DLR(2018) 52.5 CLR(HCD)(2017) 307 & 23 BLC(2018) 126 ) Mr. Rahman successfully argued before the Hon’ble court explaining the position on the guarantee in CIB Report of Nominee Director. The Chambers have deep understanding and practical knowledge of entire foreign exchange regulations as it advised different client on different aspect of it. The Chambers have dealt with several litigation involving LC, cash incentive benefit, repatriation of foreign currency over export, money exchange license etc. The reported decision i.e. 17 BLC (HC) 188; 41CLC(HCD)2012 on application of natural justice in matter involving money changer license demonstrate the ability and volume of work the firm so far handled. Besides, the Chambers advised its foreign clients over agency and liaison office permission under section 18 A & B of Foreign exchange regulation Act 1947; repatriation of profit; regulation involving foreign loan etc. The Chambers successfully acted for and against commercial banks over LC payment disputes as evident from reported cases such as, Freight Management and 16 others vs Bangladesh Bank 2 CLR (HCD) 586; 19 MLR (HCD) 336, a landmark decision on Distinction between Master and House Bill of Lading and legality of House Bill for sea leg of the journey. The lawyers of the Chambers are regularly dealing with cases relating to a letter of credit, related title suit etc. in both higher and lower judiciary. Besides, the Chambers lawyers have long experience of efficiently handling cases relating to Bank guarantee disputes in both higher and lower judiciary. The Chambers played a key role in drafting and negotiating factoring agreement involving trade between a Leading local bank and PrimaDollar (a British based Finance Group) and also IFC involving account receivable finance. The Chambers regularly appear in Artha Rin Adalat in both Arth Rin suit and execution suit. It has remarkable success record. Besides, Mr. Rahman in recent times handled few appeal and revision arising from execution suit in particular body warrant. Mr. Rahman was involved in Drafting Islamic Banking Act 2006 and Islamic Banking Guidelines along with other reputed lawyers at CBSP. The firms understanding over Islamic mode of finance is notable as it often advised bank over their Islamic Finance policy from legal point of view. Further, Chambers as a pioneer law firm taken a HPSM investment against local vessel to Admiralty court and successfully arrested the vessels. Mr. Rahman handled litigation for over 5 years and successfully assisted a UAE & Bangladesh joint venture financial institution company to exit from a dredging company by selling its minority shareholder to promoters. The finance was in the mode as equity investment as opposed to a loan. Besides, in recent times the firm successfully recovered both loan and equity investment made by a US-based venture capital company from a local solar company with remarkable return nearly three times of original investment within 3 years only by ADRs. The firm completed entire paperwork & was involved in litigation. The Chambers represented Central Bank in a high profile negotiation and mutual consultation involving a million dollar dispute involving the implementation of national payment switch throughout the country by a Singaporean IT company. The Chambers recently advised IQOPTION LTD. over IT Law Bangladesh Forex Regulation. Guideline on Debt and Equity Participation & Several circulars for Central bank for CIB, BRPD, FOREX Dept, FID etc. Venture Investment and Partners Ltd. Article: Loan recovery – Artha Rin Adalat (Vol.1 of 2007). Article: Creation of Mortgages (Vol.1 of 2007). Article: CIB reporting; List of Defaulters and Related issues (Vol.2 of 2007).